Which hero will earn a place among the gods? Dice Forge is a development game featuring innovative mechanics based on dice with removable faces. In this dice crafting game, players build their own dice. Roll your dice, manage your resources, complete ordeals before your opponents and explore multiple winning strategies. Now you control the luck of the dice! Dice Forge is definitely an amazing game with innovative dice customization game but plays very simple and fast! The game is played either 9 or 10 rounds based on number of players (2-4) and takes within 30-60 mins. It has very beautiful illustrations (as expect from French games) and nice big-plastic dice that can be customized as the game progresses. It’s very innovative that the game is about building your dice so you can get the best out of it. At first players have the same dice (with all the same sides) and as the game progressed, they will have the chance to buy die faces and apply them to their dice. This way from round to round, their dice will grow better and stronger to give them resources, golds, points or any other effect. The game is simple, in a round, player takes turn to be the active player. In each turn all players roll their two dice to receive Divine Blessings, then the active player can activate the cards they have and then take an action. The actions are either buy Die faces or go to buy card. Active player can also get one extra action by paying 2 Sun resources. Some cards have immediate effect or once per round effect aside from points. What makes this game interesting is that players keep engaged during anyone’s turn by rolling dice to get divine blessing. Also the action is fast, low downtime. And the dice are so good, chunky plastic dice with removable faces (sadly it’s a bit hard to remove the faces) and the game box comes with a special insert to store all the components easily and compact that you can set the game up in no time. Of course returning the die face back to its starting faces are not an easy feat. You need time for this. The game comes with 2 different sets of cards that you can play, beginner and advance sets. Both offer different kind of plays. Unfortunately the replay value is not really high even they offer 2 sets of cards, the game play basically stays the same and it involves high chance of dice roll luck, but hey it’s a simple and fast game, just have fun with it! And *, I love that cover. 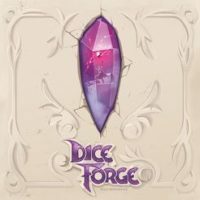 Add a Review for "Dice Forge"